Manager John Hughes has made his first signing since his own appointment 7 days ago. 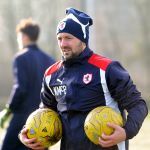 Former Motherwell, Falkirk, Hibernian and Dundee midfielder Kevin McBride has been appointed Assistant Manager with immediate effect and will take his place in the dugout for tomorrow’s clash with league leaders Hibernian. As with the manager, Kevin’s contract is until the end of this season at which point the situation will be reviewed. The 35 year old played under John Hughes at Falkirk and Easter Road between 2008 and 2011 before coming to Stark’s Park on loan in March 2011, making 7 appearances for Raith Rovers. Following Yogi’s departure from Hibs, Kevin signed for Hamilton before playing a significant part in a Dundee side that won the Championship in 2014. Kevin joined Airdrie in the summer of 2015 before hanging up his boots to concentrate on coaching. As first team coach he took temporary charge of first team affairs last summer when manager Eddie Wolecki Black suffered a stroke. However he lost that position in October last year after Gordon Dalziel was appointed Director of Football at Airdrie. Welcome to Stark’s Park, Kevin.